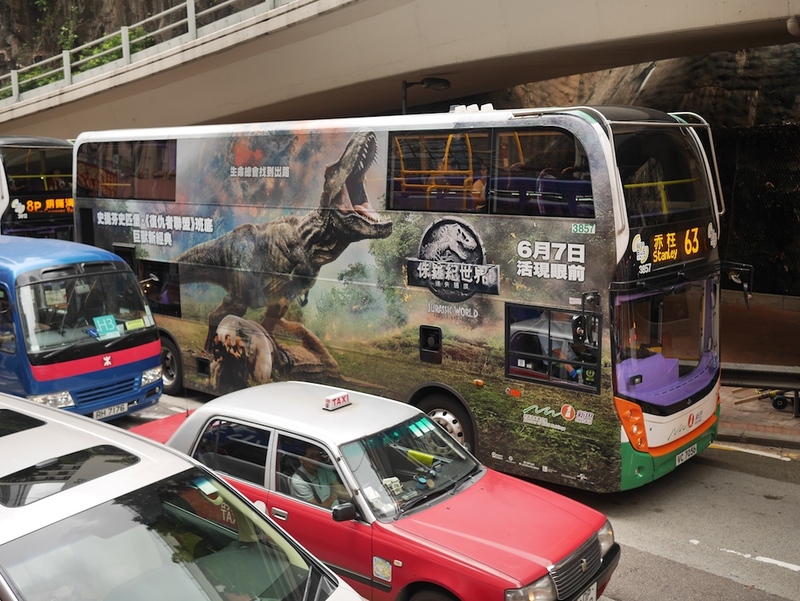 The "Meet The T. Rex" tram wasn't the only example of dinosaur-themed vehicular advertising I recently saw in Hong Kong. In the other case, the vehicle was a double-decker bus instead of a double-decker tram. Similar to the trams, Hong Kong's double-decker buses are commonly covered with a single advertisement. In the above advertisement for the movie Jurassic World: Fallen Kingdom, the special setting offered the opportunity to make it look like some of the passengers are about to become a snack. Most Hong Kong buses are safer than this. For those wondering how I photographed the bus from this angle, I must admit it required a quick reaction, especially since I was heading the opposite direction. And of course I was sitting on the second level of a tram. Unfortunately (fortunately? ), it had no dinosaurs on it.